Kiss of the Oceans," ca. 1912-1915. Postcard. Henry Morrison Flagler Museum Archives. In commemoration of the centennial of its opening in 1914, Kiss of the Oceans told the fascinating story of the construction of the Panama Canal, one of the world’s great technological achievements. Through artifacts, photographs, and documents, the exhibition illustrates the Canal’s story from sixteenth-century explorers to nineteenth-century debates, the failed French canal project of the 1880s, the massive American takeover in 1904, and finally the first official transit on August 15, 1914. Beginning in the sixteenth century, a number of countries attempted to find a convenient route from the Atlantic to the Pacific, through the narrow land bridge connecting North and South America. It was widely recognized that a waterway across the Isthmus would have a major impact on world commerce and power. However, until the twentieth century, sailing around Cape Horn at the southern tip of South America remained the only water route between the two oceans. Serious work on a canal, however, was not possible until the technological advancements of the late nineteenth century. The 1848 discovery of gold in California added urgency to the idea of a canal, as ships bearing valuable gold cargo were lost rounding the Horn. After successfully completing the Suez Canal in 1869, the French attempted to build a sea-level canal through present-day Panama in the 1880s. President Theodore Roosevelt argued strongly for America’s involvement in the Canal project. The United States took over the failed French endeavor in 1904, and within a decade the waterway became a reality. Henry Flagler also kept a keen eye on developments in Central America. Key West, the closest deepwater port in the United States to the area, was poised to become a major stop for ships transiting a Central American canal. While Flagler had considered extending the Florida East Coast Railway to Key West since at least 1891 and he had already secured the only charter from the Florida legislature, which would allow him the sole option to build such railroad, he waited to move forward until the United States government announced its plan in 1904 to build the Canal. The project was put into motion immediately, and the construction of the Over-Sea Railroad began in 1905. The second-largest project in the world after the Panama Canal and itself considered the greatest engineering feat ever accomplished by a private citizen, the Over-Sea Railroad was open and ready within seven years. The Isthmus was considered not only commercially significant, but also vital to military strength in the Western Hemisphere. The completion of the Panama Canal project was the climax of the rise of the United States as a world power, and helped secure its dominance in the twentieth century. Kiss of the Oceans will present the history of America’s involvement in the Canal Zone and examine the political developments in Central America that made the Canal possible. The Canal project utilized 75,000 workers from all over the world, eager to contribute to the historical undertaking. Workers endured hard labor, harsh tropical weather, disease, and deprivation. The story of these workers, their lives in the Canal Zone, and the challenges they met will be told in the exhibition. The path of the Canal crossed difficult terrain and required the construction of four dams, two artificial lakes, and three sets of locks. One of the greatest engineering challenges of all time was the massive Culebra Cut crossing the Continental Divide, which rose more than 360 feet above sea level. Ultimately 268,000,000 cubic yards of material was excavated to make way for the Panama Canal. It was an astounding engineering feat - the quintessential expression of the great optimism of the Gilded Age. It was also the most expensive project ever attempted up to that time, at a cost of hundreds of millions of French francs and nearly 400 million American dollars. By cutting 7,800 miles off the trip from New York to San Francisco, the Canal has proven itself invaluable to commerce and politics. More than a million ships traveled the Canal in the last century. Today the Panama Canal - still vital to world commerce - is being expanded and updated to accommodate a new generation of vessels. Kiss of the Oceans was organized by the Flagler Museum. 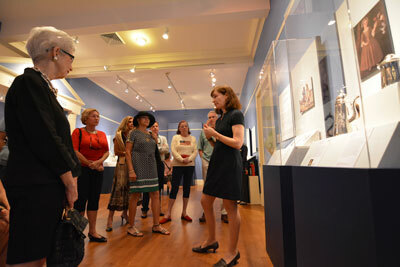 Join Flagler Museum’s Assistant Curator Janel Trull for a tour of the Fall Exhibition, Kiss Of The Oceans: The Meeting Of The Atlantic And The Pacific. Ms. Trull will provide visitors with an expert perspective into the fascinating story of the construction of the Panama Canal through artifacts, photographs, and documents. 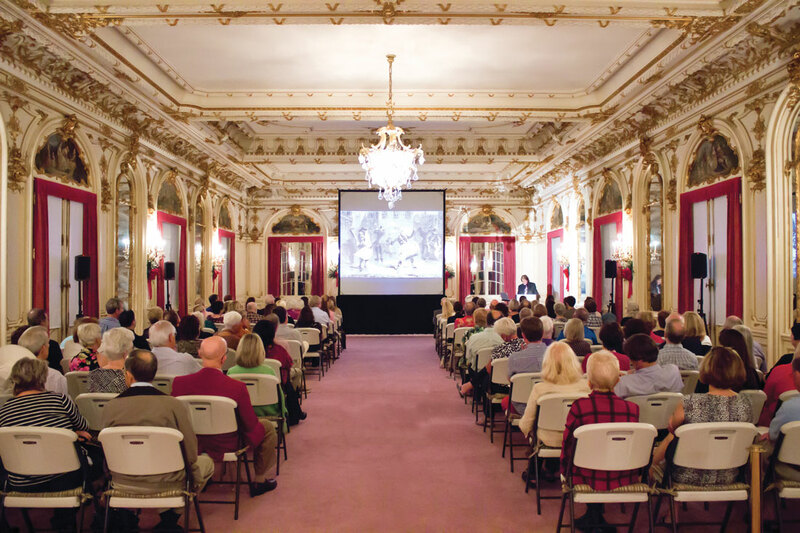 In conjunction with the Fall Exhibition, Kiss of the Oceans, Dr. Julie Greene will present the special lecture, "The Canal Builders" inside the Flagler Museum's Grand Ballroom. There will be a book signing following the lecture. Dr. Julie Greene is the president of the Society for Historians of the Gilded Age and Progressive Era. She is a 2013-2014 Rockefeller Foundation Fellow and Professor of History at the University of Maryland at College Park. 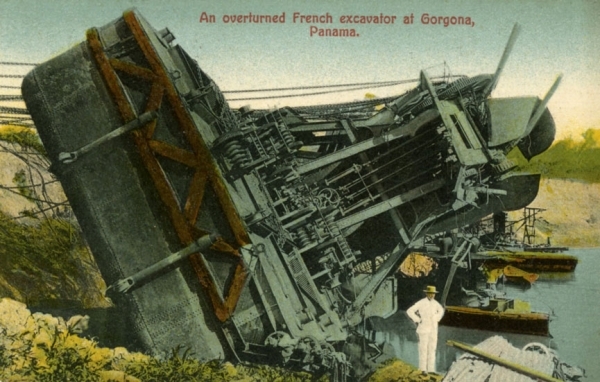 An abandoned French excavator at Gorgona, Panama, ca. 1907. Postcard. Henry Morrison Flagler Museum Archives. A giant steam shovel, 1913. "One shovel had a record of digging and loading 4,823 cubic yards of earth and rock in one day." Henry Morrison Flagler Museum Archives. One of the "Great Gates" under construction - Gatun Locks, ca. 1907. Postcard. Henry Morrison Flagler Museum Archives. The meeting of the Atlantic and Pacific, "The Kiss of the Oceans," ca. 1912-1915. Postcard. Henry Morrison Flagler Museum Archives. President Theodore Roosevelt inspecting the work at the bottom of the Culebra Cut, 1906. Henry Morrison Flagler Museum Archives. The S.S. Ancon passing through the Culebra Cut, during the first transit on the Panama Canal in 1914. Postcard. Henry Morrison Flagler Museum Archives.